Restricting our electric – Live MoHo! 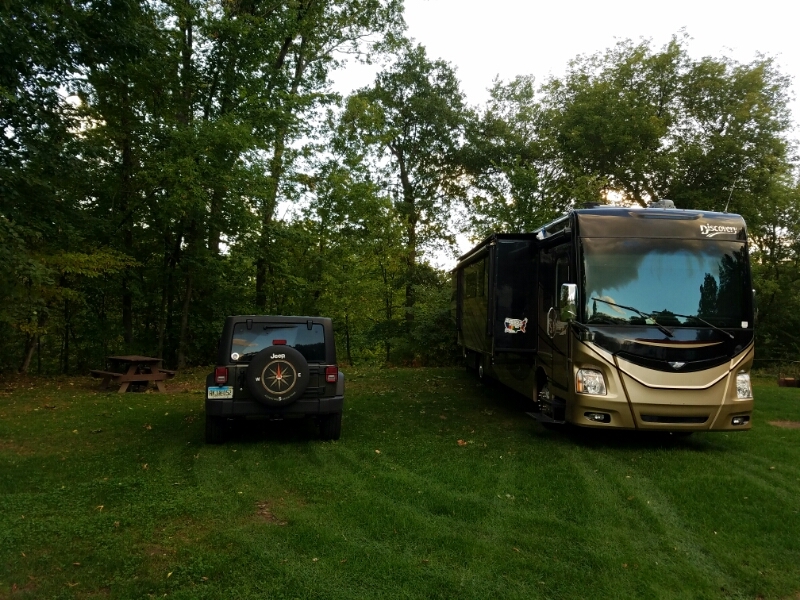 Since we extended our stay in Burlington hoping for some foliage colors, we had to work around availability at the campground. We have had to move spots, but the new spot isn’t available for one night. So, we have to move into a one-night temp spot. No water hookups and only 30 amp power. I had to dig our our 50amp to 30amp adapter. Fortunately, we had one. It should be in everyone’s bag of MoHo gadgets. The adapter works! Unfortunately, it also means we’re on an electrical starvation diet for one day. I felt like our electrical appliances were suddenly a little like Chris Farley when he put on David Spade’s jacket. 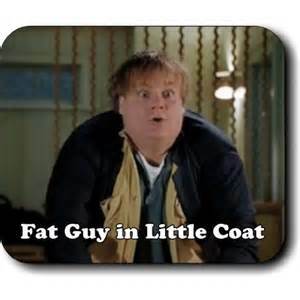 If you haven’t seen Tommy Boy, well then shame on you. Part of our challenge is that the one night we’re on the 30amp diet is the coldest night we’ve experienced since it snowed on us in Williams AZ (see “snowed in“). Low forecast to be 39 degrees. Now normally we run our heat pump in the rear plus propane furnace in the front. The propane furnace blower takes about 6 amps, and the heat pump takes about 12. We usually run a little electric space heater for the birds, which takes around 10amps. 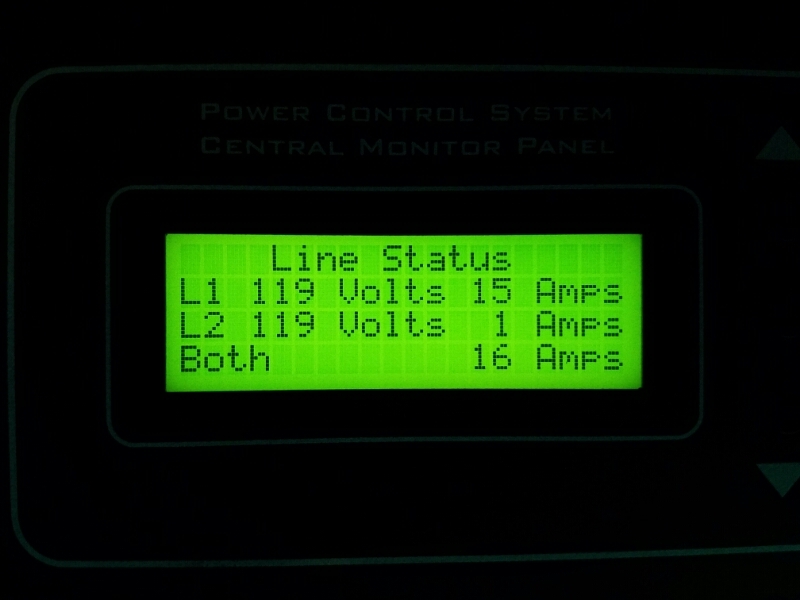 10+6+12 = 28amps. Just barely under the limit. 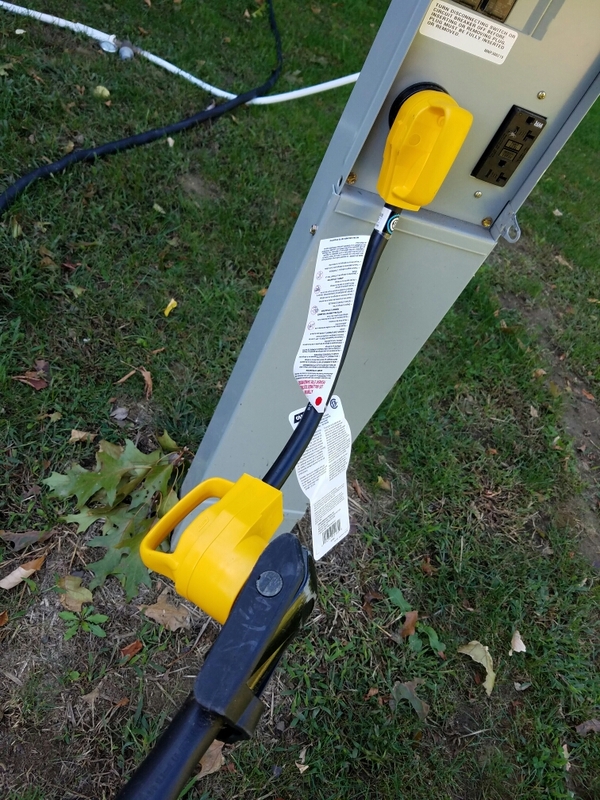 Parasitic loads, like our phone chargers, the refrigerator, our DirecTV box, add a few more amps. Now we’re at the limit. The problem is that the heat pump spikes up to about 35-38 amps for a split second when it first starts up. If we’re running a propane furnace, plus the parasitic loads from refrigerator and other electronics, and the heat pump fires up, we could pop the breaker outside. Our warning would be when we woke up freezing and realized we had no power. Our coach will flip over to the battery systems if that happens, but they don’t provide enough power to run the heat pump. So we would have to go outside and reset the breaker. Not what we want to do at 2am when its ridiculously cold outside. 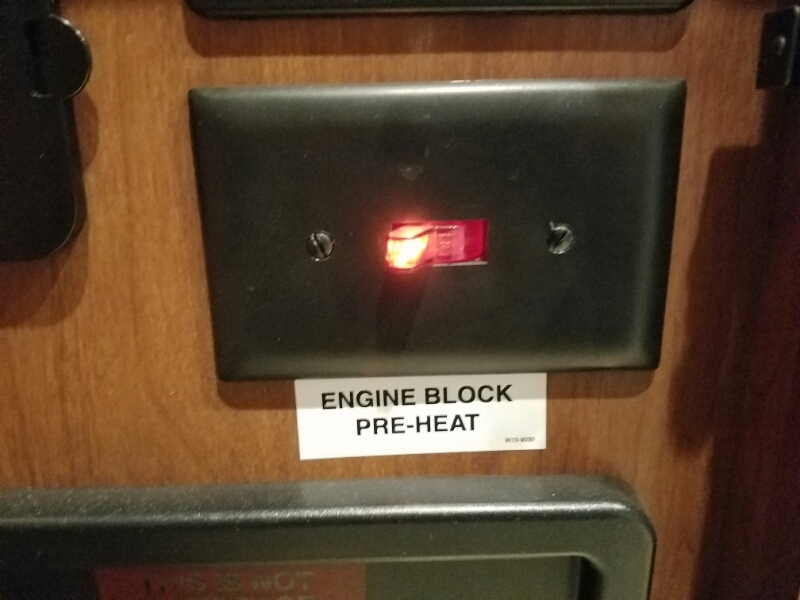 Of course, I would make Heather go out and reset the breaker. Just kidding. We’d flip for it. We kept an eagle eye on the electric meter. So far, so good. It was at this point that we realized with temperatures dipping into the 30s, our move to another site in the morning would be tough on the cold engine. Now, we have a nifty engine block heater we can flip on. Unfortunately, it uses 9 amps. After thinking it over, we realized the easiest solution would be to switch our rear heat from heat pump to propane furnace. Yep, our coach has two separate furnaces. This would solve our electrical load challenge. Especially because they don’t run continuously. The propane heaters are comfy too. Those bad boys heat up FAST. The only downside is that they use propane which we eventually have to refill. Still, the last time we filled was in Gallup New Mexico. If you read our blog, you’ll know that was a LONG time ago. Specifically, four and a half months ago. And our current level is still at 2/3. This is the beauty of our 38 gallon propane tank! On the plus side, the spot we were parked in was huge! Room for a couple MoHos. 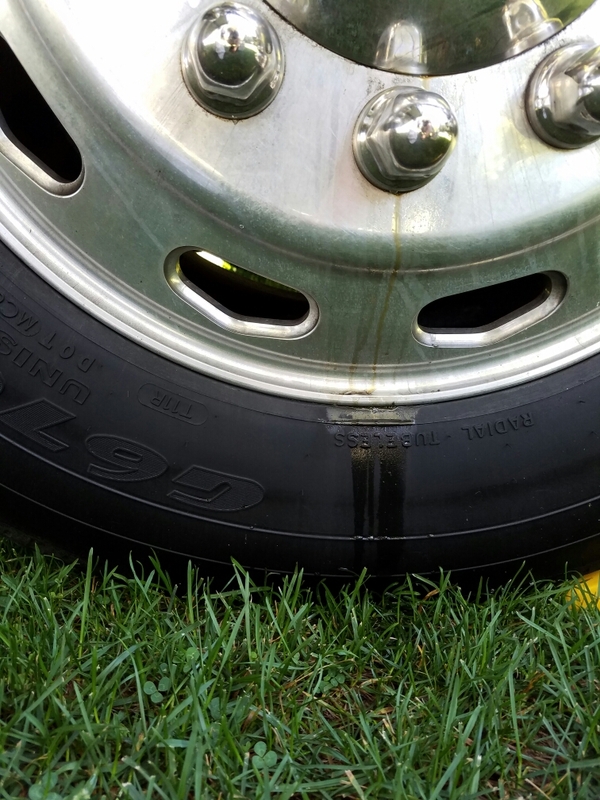 While I was setting out to move to our temporary spot, I noticed some oil had run down our front wheel. Rut Roh. Our MoHo uses oiled hubs, meaning the wheel bearings are lubricated by an oil bath. That oil actually has to be changed regularly. I popped off the hub cap and looked at the hub. The oil looked ok, maybe a tiny bit low. If you look at the hub, see the rubber plug in the middle? The ring around that hub is clear plastic. It looks black in the photo because it looks into a black hub. But look at the bottom of the hub. See that green area that if it was a clock would be between 5-6-7 position? That’s the oil. Max level isn’t much higher than that. The drain plug is actually on the top of the photo. 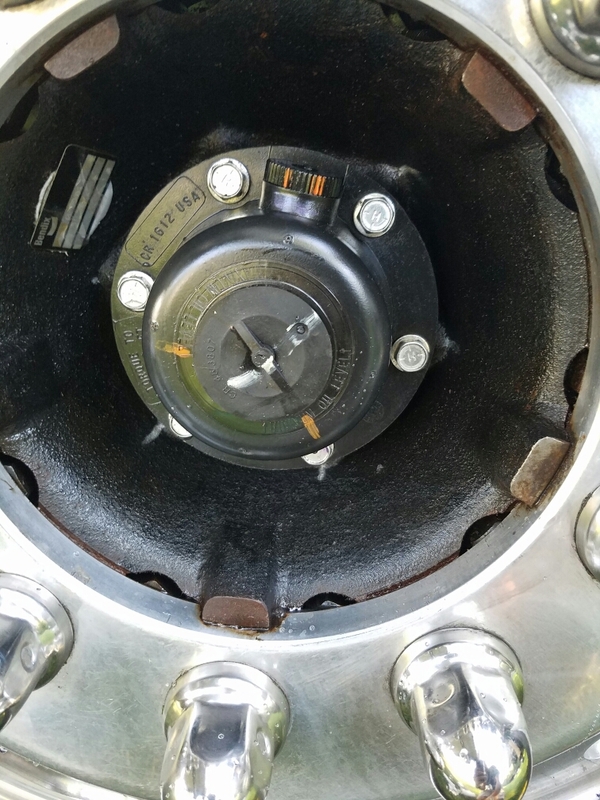 If I were draining the hub, I would rotate that wheel until the drain plug is pointing straight down (vs. almost straight up here) and unscrew it so the oil would drain out. In this case, I just tightened the plug. Best guess is that the oil I saw on the wheel was slung out of that drain plug and dripped down over that wheel. I did get some gear lube (75w-90) oil and put a bit more in that hub. But it doesn’t seem to be leaking so I’m pretty sure its not anything to worry about. These are the joys of living MoHo. As we were moving, I saw something I have never seen before. 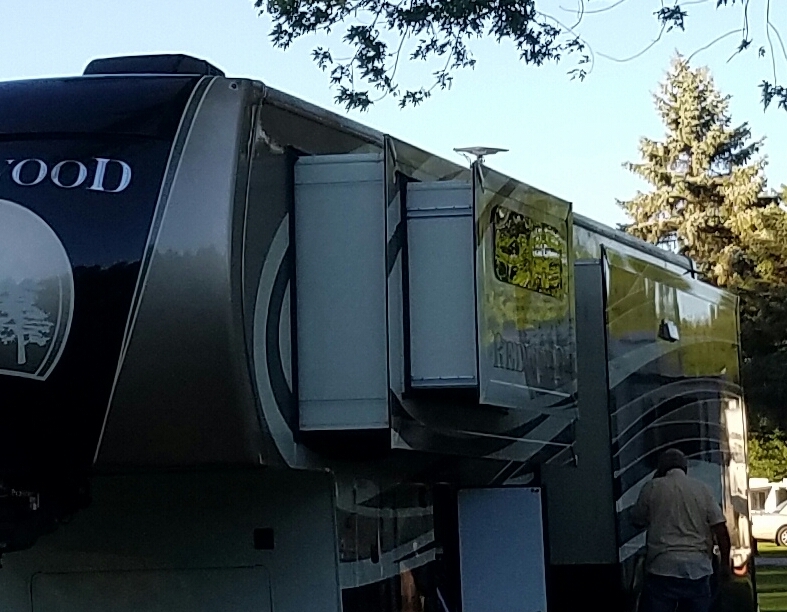 A 5th wheel trailer that had a slideout room with its own slideout room! I had to do a double take when I saw this! Its kind of ingenious, but I can only imagine how much complexity and potential for breakdown that creates!